This evening my wife and I enjoyed watching this debate with another couple over pizza. It generated a lively and animated discussion. Our teenage daughters watched with us for a while and we were able to discuss some of the points being debated. I highly recommend this video, not only just to watch, but to watch in a group setting and discussion tool. Yes, it is a bit long, but it is well worth it. As a Christian, I found Lennox’s arguments convincing and I am very much in favor of an evidence-based faith. As Lennox states, a belief in God, a Creator, does indeed make scientific discovery more wonderful, and the rise of science in the Middle Ages was rooted in the Christian faith. Far from being a show stopper, as is stated by Atkins, it was this belief in a rational and ordered universe that inspired scientific investigation. Atkins consistently (i.e. over and over and over…) labels belief in design as laziness. As one commenter to the Youtube link asked, “how many times can one man say ‘Intellectual laziness’?” We were asking the same. Yet it was Atkins who demonstrated laziness in dismissing the conversions of prominent atheists like Anthony Flew, Francis Collins, C.S. Lewis and Alister McGrath as premature senility. This “laziness” is simply a straw man argument, packed from a stereotyped blind-faith anti-intellectualism and used to “prove” that belief in design is this show stopper. Those that fit this description, who fall back on various versions of God of the gaps explanations in place of genuine inquiry, are misled and hopefully few. Regardless, they do not represent those that do look at the ever accumulating scientific data on our world and universe and decides the evidence points to a Designer. This is the importance of evidence-based faith. Given several examples of designed items (his own book, a 747, Paley’s watch), Atkins is unable to make the connection between these designed items and a designed universe. He is more comfortable attributing creative powers to matter and chance. Overall, we found Atkins arrogant, a bit fidgety, but with a delightful accent. Ironically, as a scientist, he described himself as deeply humble. We were left to conclude it was so deep as to be unseen. John Lennox was lively and defined his arguments well. As to science, he considers it “thinking God’s thoughts after Him”. This entry was posted in Science and tagged Intelligent Design, John C. Lennox, Peter Atkins, science in the middle ages. If the Earth Moves, Can It Be Old? Lennox begins his book with an apt example and compels the reader to not repeat the mistakes of the past. It is, in my opinion, a brilliant way to begin—a look at historical fact. In 1543, Nicolaus Copernicus published “On the Revolutions of the Celestial Orbs” and started what has become known as the Copernican Revolution. Based on careful observation, he proposed that the solar system is heliocentric (the earth revolving around the sun) as opposed to geocentric (the earth is the center of the solar system and the sun revolving around the earth). He was ridiculed by the church (Luther & Calvin), which held the geocentric position (which was Aristotelian in origin, actually). If taken literally, these verses support a geocentric view of the solar system, but we know from modern science that this is simply not true. But the beliefs of the church did not change during the lifetime of Copernicus. At some point later, though, the heliocentric model became undeniable and church changed its belief. Unless I am missing some major revisionist history, this example is simply a fact. Is Lennox saying that the Bible is wrong? Is he trying to discredit the Bible? No, not at all. He is saying these verses, and I think this has been proven, cannot be taken literally. Or should I say, literalistically. Was the car literally “flying”? No, it was driving fast. “Flying” is just a metaphor, but it is a metaphor for something real—we imagine a plane zipping past and associate that to the speed of the car. Is he made of wood, with a latch and hinges? No, it is a metaphor, and again for something real—Jesus literally is a doorway into a real experience of salvation and life. A literalistic interpretation says the car really was flying through the air and Jesus really is made of planks of wood. I have never really thought through the distinction of these words, but this makes sense to me. It applies completely to the interpretation of the above scripture, taken to support the geocentric view of the solar system. Can the earth be moved? If interpreted literalistically, it cannot. Since we know the earth does move, we know that this verse is a metaphor—but it is a metaphor for a literal reality that God has established. God is teaching us about physics metaphorically because it was beyond our ability to know at that time. We now know from Newton and others that the solar system is very stable. We could point to the “fine-tuning” of universal laws that modern physicists have discovered which, if their constants were altered slightly, the universe would fall apart (or never have existed as we know it). A disturbing thought then occurred to me: these people firmly believed they had a Biblical worldview of the reality. They had convictions and a very real idea of the heavens. Yet, it was shattered by the discoveries of science. This situation begs the question: Are there verses we have taken literalistically that are instead meant as only as metaphors? For instance, the Bible says that God sits in heaven on a throne. Is there a literal man on a literal throne? No, I don’t think so…and yes, because it is a metaphor for a literal reality—God reigns. Whether a verse can be taken literalistically (“Jesus wept.”) or metaphorically, it does not reduce or discredit the Bible in any way. What does this mean for our Christian worldview? How are we to see our world? What are we to accept from scientific discoveries? Do we accept every theory because a scientist proposes it? Do reject theories because the scientists are atheists? We all believe in the structure of DNA, yet Watson & Crick were solid atheists. Also, if we change our position or belief on something, do we discredit the Bible? Or, like those who had to eventually acknowledge heliocentricity, are we willing to acknowledge our error, if science can prove a theory correct? What do we teach our children about this and other examples? If we bring up Copernicus, they may wonder what to believe. They may question leadership, or their Sunday School curriculum. If we don’t talk about it, chances are some atheist high school or college teacher will, and they will do it to prove the church ridiculous. Let’s return to Copernicus. He did not publish his work to defy God. He was a scientist because he believed in God and sought to discover His creation. I think his attitude needs to be our approach today. We need to be able to look at scientific investigations and evaluate them in light both of a literalistic and metaphorical interpretation. What keeps us from that sometimes is the militancy of atheist scientists and their absolute insistence that science defines atheism. They have fused science to natural philosophy and refuse to let go, and they are just as evangelical in their efforts to convert the masses to their philosophy. But science is science—philosophy, whether religious or atheist, is inherent to the observer and rests outside of science. So, I am deliberately not stating my position on young or old earth because I think the focus of this post needs to be on a metaphor (for a literal reality) or literalistic view of Genesis 1-2. The earth may be 6000 years old, but if it is 4.5 billion, does that mean the Bible is wrong? If I believe the earth is old, am I really threatening the authority of the Bible? I don’t think so. Do you? 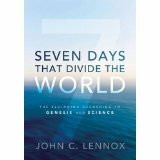 This entry was posted in Religion, Science and tagged Copernicus, heliocentricity, John C. Lennox, literal, literalistic, Seven Days that Divide the World.